For today’s slot inspection, we’ll be putting a pair of newcomers under the microscope. Both Village Kid and Copy Cats have been making waves among gamers since their recent debuts, so we thought we’d take a look at both ends and see exactly what they bring to the table. The good news being that as far as first impressions ago, we’d definitely recommend checking out both. First up, if you recognise the latest release from the folks at Play ‘N Go, there’s a chance you might have seen it before. Interestingly, Village Kid was previously only available for the Turkish online casino market and has only just now made its way into the west. Which in turn means it isn’t what you’d call an entirely new concept, but is at least new to most folks over here! What you’re looking at is a five-reel slot with 20 paylines to play for and a predominantly food-based theme presented with a backdrop of a Turkish market. Most of the symbols take the form of mouth-watering Turkish delicacies, along with the usual playing card values. There’s a wild symbol in the form of a bowl of ice cream, which along with taking the place of most other symbols in the game is also worth a prize of 150X your bet, if you manage to line up five in a row. The Street Food Bonus feature adds a little spice to the action and can be accessed by landing three Angry Mom bonus symbols at the same time. It’s a pick-me round where a bunch of doors hide even more delightful delicacies, with the chance to pick up cash prizes as high as 500X your bet. And then of course there’s the free spins bonus round, for which you will need to land at least three Village Kid scatters in any position. You’ll then be able to choose from three different options for the bonus round – five free spins with a multiplier of 6X, 10 free spins with a multiplier of 3X or 15 free spins with a multiplier of 2X. 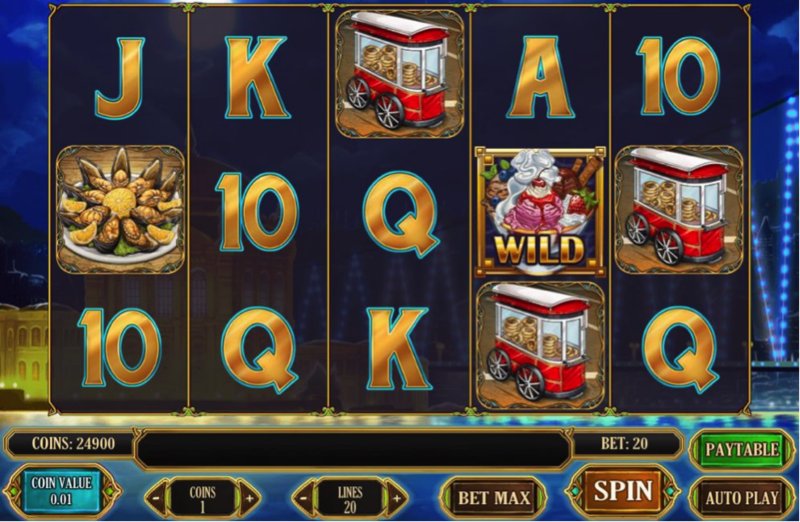 During the free spins bonus round, the ice cream wild is particularly lucrative as it can double anything you win. Which means that if you go for the 6X multiplier option, you could be looking at 12X your winning line amount. Which in turn means the potential for taking home some seriously tasty prizes. The only downside being that there is no way of triggering additional free spins while the bonus round plays out. On the whole, Village Kid comes in at around the mid-level in terms of variance and has a couple of enjoyable bonus features to keep things entertaining. What’s more, the highest possible payout goes way beyond 6,500X your bet, so there’s certainly plenty to play for. Just don’t be surprised if by the time you’re done with a few spins, you’ve got an insatiable craving for Turkish food! Next up, Net Entertainment have worked their magic to come up with Copy Cats – another feline-themed slot clearly taking aim at anyone in love with all-things furry and fabulous. The only difference being that these cats are somewhat unique, in that they can copy themselves and hand out bigger cash prizes as a result. Copy Cats can be played with just about any device you can think of and spins are available from 25p up to a maximum of £125 each. In terms of visuals, everything is exactly as expected from these guys – cute, colourful, quirky and cartoony. The symbols themselves are also predictable, including the four feline stars of the show themselves and the usual contingency of toy mice, fish bones, paw prints and so on. During normal play, it’s the red cat that can send you home with the biggest prize – five in a row being worth a payout worth 20X your bet. The wild symbol takes the form of a golden cat with a ball of string and can take the place for every other symbol, with the exception of the bonus symbol. If any of the cat symbols appear on the first reel fully stacked, the Copy Cats feature will kick in. What this basically means is that every other cat symbol on the rest of the reels will transform to match the symbol stacked on the first reel, meaning solid cash prizes are largely guaranteed. Other than this, there’s also a free spins bonus round for which you will need to land three bonus scatters on the first, third and fifth reels at the same time. You’ll start out with 10 free games, though can increase this to 20 if you land another bonus symbol during the free spins round. In addition, every cat that appears on the first reel during the bonus round is wild, once again making decent wins an inevitability. 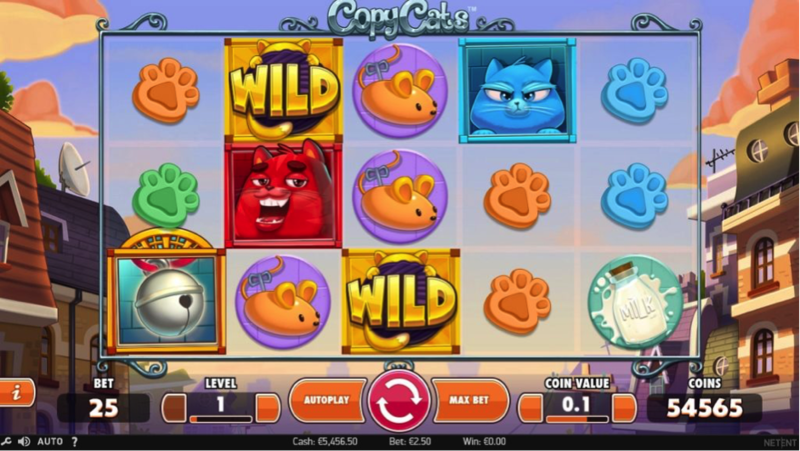 Copy Cats makes for an enjoyable experience as both the base game and the free spins feature are highly entertaining and have the potential to pay out a maximum of 200X your bet. It’s is comparatively low on the variance scale, which means that while prizes don’t tend to be enormous, you don’t find yourself going through too many dry spells before something interesting happens. Even if you aren’t particularly fond of cats in real life, you probably won’t regret spending a little time with these guys!